The Royal Bled Golf Course is the oldest and largest golf course in Slovenia. In 2014, it ranked 49th on the Golf World Magazine list of the Top 100 Golf Courses in Continental Europe. Take a look at our golf packages! Enjoy an unparalleled view of the Alpine peaks while playing golf and bask in the unique scenery of Lake Bled, the island and the castle during your time here. You can choose from the elegant Grand Hotel Toplice, the Hotel Golf where tradition is respected in a modern way, and the Hotel Park for a more active vacation. Treat yourself to moments of relaxation, pampering at the wellness centres, kilometres of swimming, tasting the fresh and seasonal local cuisine or simply enjoying the view of the charming Bled, which fills you with energy again and again. The Grand Hotel Toplice is located on the shore of Lake Bled, from where you can admire the loveliest view of the lake, Bled Island and Bled Castle. S ...tep into the hotel with the longest tradition at Bled and listen to the stories whispered by rustic parquet under your feet and emanating from romantic furniture with a history spanning over 80 years. Hotel Golf transposes the traditional handicrafts and exceptional natural features of Bled into the hotel interior. The respect for everything local i ...s what makes the hotel unique and ensures that healthy habits, which have been preserved through centuries due to their effectiveness, will make guests feel comfortable and well. Hotel Park is designed for those who enjoy being at the centre of events – the Bled promenade is only a few steps away! The hotel is an excellent star ...ting point for active adventures in Bled and the surrounding area. Various hotel wellness facilities, diverse wellness concepts – a magnificent view of Lake Bled from everywhere. Spa Luisa in the elegant Grand Hotel T ...oplice with a spring of thermal mineral water, Živa Wellness at Hotel Golf, where you can treat yourself to holistic relaxation with the Rikli approach. Fresh, seasonal and local ingredients in a cuisine with a modern twist. All this comes with the best of views ... the Park Café, serving the most deli ...cious original Bled cream cake, and the Julijana Restaurant at the Grand Hotel Toplice, where chef Simon Bertoncelj, a member of the Slovenian national cooking team, will cook for you. It will melt in your mouth! Bled is the place where you can bathe in the summer or in the winter. In the summer, you can freshen up in the cold blue Lake Bled or choose from a va ...riety of hotel wellness facilities and pools with a magnificent view of Lake Bled. The Royal Bled Golf Course is the oldest and largest golf course in Slovenia. In 2014, it ranked 49th on the Golf World Magazine list of the Top 100 Golf Courses in Continental Europe. The course boasts unique natural sights and a splendid view of the highest Slovenian peaks. The facility comprises the 18-hole King’s Course and the 9-hole Lake Course, offering numerous opportunities for novices, but also satisfying the most demanding amateurs and professionals alike. 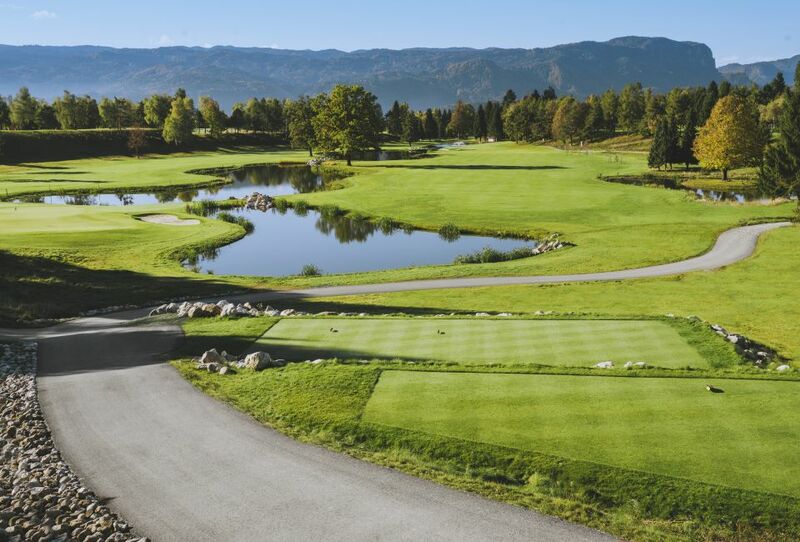 In addition to the two courses, the Royal Bled Golf Course comprises a large practice area covered with natural grass, a Golf Academy, a golf equipment shop, wardrobes for guests and a storage room for equipment.